Are you suffering from an inflamed and painful shoulder and finding it increasingly difficult to move the affected arm? If you have recently injured the region, there is every possibility that you are having a dislocated shoulder. Get to know about this condition in detail, including its causes and treatment options, before seeking medical assistance. 1 What is Dislocated shoulder? It refers to an injurious condition characterized by the protuberance of the upper arm bone from the cup-like socket that is a part of the shoulder blade. The ICD 9 Code for this condition is 831. Dislocation of the shoulder may also lead to other problems like weakness, numbness or tingling sensations close to the site of injury such as down the arm or in the neck. There can be spasms in the muscle due to disruption which often increases the intensity of pain. The shoulder can move in various directions. As a result, you may suffer from dislocation downward, forward or backward. The dislocation can be complete or partial. The fibrous tissues that attach the ligaments (shoulder bones) can get torn or stretched, often complicating the condition. Indulging in contact sports, such as martial arts, hockey or football, commonly results in this type of injury. Dislocation may also occur due to participation in sports activities like volleyball and gymnastics that involve falling down. A severe blow to the shoulder during an activity or an accident commonly gives rise to this problem. Falling down from a ladder or tripping on a rope or rug may also injure the shoulder joint and result in dislocation. A sudden impact to the shoulder causes its bones to be pulled by a strong force, thus resulting in a dislocation. Excessive rotation of the shoulder joint can make the humerus (upper arm bone) project out of the glenoid (shoulder socket) that is a part of the scapula (shoulder blade). This is complete dislocation. Affected individuals may also suffer from partial dislocation (subluxation), in which the bone of the upper arm remains partly inside and partly outside the glenoid. 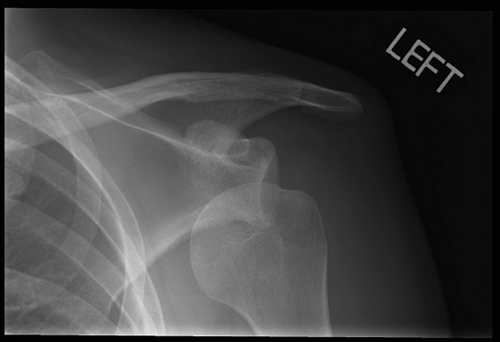 An X ray examination of the shoulder joint displays the type and extent of dislocation as well as broken bones or any other damage to the shoulder joint. This imaging exam employs a magnetic field to produce cross-sectional images of the affected section. The images help physicians to assess the nature of damage to the soft tissue structures in the region surrounding the shoulder joint. The process measures the electrical charges produced in the muscles of sufferers, at the time of rest as well as during contraction, with the aid of a special apparatus. Physicians analyze the electrical signals in the area to assess the damage to the nerve caused by repeated or severe dislocation. Patients are advised to provide their injured joint with as much rest as possible. They are asked to avoid all sports and non-sports activities that might cause stress to the joint. In some severe cases, doctors use a sling or special splint to immobilize the shoulder of patients for some time ranging from a few days to a few weeks. 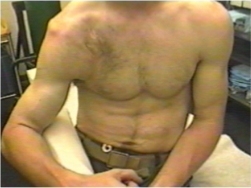 The time span for immobilization depends on the type of the dislocation and how soon the shoulder is immobilized with a splint after dislocation. Physicians might prescribe a muscle relaxant or an analgesic (pain relieving medicine) to provide comfort to patients while they are recuperating from a shoulder injury. Physicians may also use some gentle other tactics to help the shoulder bone slide back to its actual position, which involves a maneuver known as “Closed Reduction”. Sufferers might require a sedative or muscle relaxant for support, depending on the amount of inflammation and pain that they are found to be suffering from. In rare cases, a general anesthetic is injected into the shoulder before manipulating the humerus (shoulder bones). When the bones snap back into place, any pain or inflammation is likely to improve almost instantly. If you are suffering from weakened ligaments or bones in the shoulder area, you may require a surgical cure. Operative treatment is also necessary for those who tend to suffer from shoulder instability or shoulder dislocations, even after proper strengthening and rehabilitation. In rare cases, affected individuals may require operative remedy to reverse any damage to the blood vessels or nerves due to dislocation. Once the sling or shoulder splint has been removed, patients are often advised to gradually begin a rehabilitation program that is designed to restore strength and range of motion to the shoulder joint. Minor cases of the condition can be healed with the help of home remedies. Such measures may also be used for supportive treatment of the disease, along with medical procedures. This involves limiting or negating all movements and activities that can worsen the problem, or might have led to the condition in the first place. Restrict lifting heavy stuff or raising arms over head until the shoulder has healed completely. Applying ice onto the injured area helps decrease pain and inflammation associated with the condition. It is necessary to place a thin strip of cloth over the region and apply ice over it. This would help you avoid risks of ice burn. Use ice treatment for 15-20 minutes, every few hours hence, during the first few days. When the shoulder improves a little with ice treatment, apply hot compresses over the injured spot with heating pads or hot packs to ease soreness and tightness of muscles in the region. Reduce application of heat to 20 minutes. Over-the-counter (OTC) analgesics like Ibuprofen (Motrin or Advil), Acetaminophen (Tylenol), Aspirin or Naproxen (Aleve) may provide patients with relief from painful symptoms. It is necessary to read the label for dosage instructions and stop taking the medications when the pain subsides. Practice some gentle exercises a day or two after visiting your physician. This would help maintain the range of motion of your shoulder joint. Continue exercising when your injury has healed and the range of motion has improved. Performing a balanced strengthening program and stretching exercises on a daily basis can help you prevent the condition from recurring. Ask your physician, or a physical therapist, for an appropriate workout program for yourself. Leaving the joint completely inactive can make it stiff and further complicate the problem by leading to Frozen shoulder – a condition that makes you unable to even move your shoulder. Consult your doctor and begin rehab exercises as soon as you are advised to perform them. Bend your elbow to a right angle. Press the back of your wrist against the frame of the door. Try pressing your hand toward the outside into the frame. Repeat the process. Stop after 3 sets (10 repetitions in each set). Press the front of your wrist against the frame of the door. Try pressing your palm into the frame. Place a pillow between your arms and your chest. Squeeze the pillow with the help of both arms. Hold the count for 5 seconds. Repeat the process. Stop after you have performed 3 sets (10 repetitions in each set). Stand upright, facing a wall. Bend your elbow at a right angle and keep it positioned close to your body. Extend your fist forward and press it against the wall. Hold the stance for 5 seconds, before taking rest. Perform the steps for a total of 10 times. This completes one set. Perform two more sets, and 30 repetitions in total. An affected shoulder usually takes a few weeks to heal after proper treatment. Following reduction, patients are advised to keep their arm rested in a sling for several weeks. It usually takes anywhere from 12-16 weeks to recover completely from a dislocated shoulder. Generally, sufferers can resume most activities within a couple of weeks. However, they should avoid heavy lifting and sports activities that demand using the shoulder for 6 to 36 weeks. F you have a job that is physically strenuous, discuss the issue with your doctor and ask for proper advice. In case of a broken arm, sufferers need to wear a sling for up to 6 weeks. The time for recovery is likely to be greater in such cases. In case of such complications, patients might require a surgical cure for repairing the problems. Males tend to suffer more from this condition than females. Young people are naturally more inclined to increased physical activities, such as sports, which increases the risk of having the problem for them. Wearing protective gear while taking part in sports activities that involve contact and falls. Taking precautions to avoid falls and wearing joint guards while venturing on rough surfaces. Exercising on a regular basis to maintain flexibility and strength in the muscles and joints. It is necessary for you to keep the affected joint as much immobilized as you can. Use a sling or splint to prevent worsening of the problem. Do not attempt by yourself to move or force the joint back into its place. This can cause you much pain and damage your shoulder as well as the adjoining nerves, muscles blood vessels or ligaments. Press ice over the affected shoulder area to control any internal bleeding as well as accumulation of fluids in and around the impaired joint. Ice application would also help decrease pain and inflammation in the region. If you suspect yourself to be suffering from a dislocated shoulder, seek medical help on an immediate basis. Early medical detection and treatment would help you avoid all possible complications and make a quicker recovery from the condition.